Electronic devices such as cell phones, laptops, tablets, and headphones are made out of rigid materials like silicon and copper. The ability to make electronics out of materials that are flexible, stretchable, and soft would enable many exciting applications. For example, electronics could be placed in common objects like car seats, into clothing . . . even on or in the body. One approach to making electronics that have interesting mechanical properties is to use materials that have interesting mechanical properties. Our research group has been studying liquid metals for this purpose. When most people hear the term “liquid metal,” they usually think about mercury or the movie The Terminator. We are studying gallium, another liquid metallic element that, unlike mercury, is not considered toxic. By itself, gallium is solid at room temperature, but adding small amounts of other metals like indium changes its properties, and it becomes liquid. 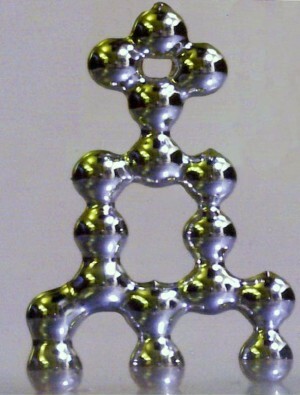 There are several ways to pattern gallium alloys into useful shapes, including antennas, self-healing circuits, stretchable wires, and 3D printed structures. Recently, we found that we could make soft circuit boards using the same material. The first step involves sonicating the metal in ethanol. Sonication utilizes the vibrations of sound waves to break the metal up into very small droplets around 100 nanometers in diameter, which is about the size of an average virus. We then placed these droplets between two sheets of rubber to make a sandwich. To our surprise, the metal did not conduct electricity, because it was too difficult for electrons to “hop” between particles. We found that if we pushed down on the particles, however, they would merge together to create a conductive pathway. You might imagine this process like squishing water balloons, causing them to rupture so the water from different balloons pools together. We found that even writing with a magic marker created enough pressure to merge the particles—as a result, we were able to draw conductive pathways by hand! Other research groups from Purdue and Carnegie Mellon have made similar findings, which may be a sign that it is a good idea. Once these conductive pathways have been drawn, they can be connected to wires, LEDs, and other electronic components to make soft circuit boards. We believe another intriguing use of this technology would be to draw antennas when they are needed for communication. Please consider watching our videos to better understand the concepts. Thanks for reading! Fig. 1 (Click to enlarge) The image on the left shows the gallium alloy in ethanol (a) before sonication, and (b) after sonication. 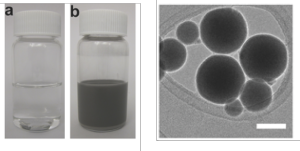 The image on the right is a transmission electron micrograph (TEM) of liquid gallium nanopartices; the scale bar is 50 nanometers. Fig. 2 (Click to enlarge) Structure 3D-printed using liquid gallium. Fig. 3 (Click to enlarge) A conductive "Liquid" pattern. The scale bar is 3 mm.